During exercise in the heat, sweat output often exceeds water intake which results in a body water deficit (hypohydration) and electrolyte losses. Daily water losses can be substantial and persons need to emphasize drinking during exercise as well as at mealtime. 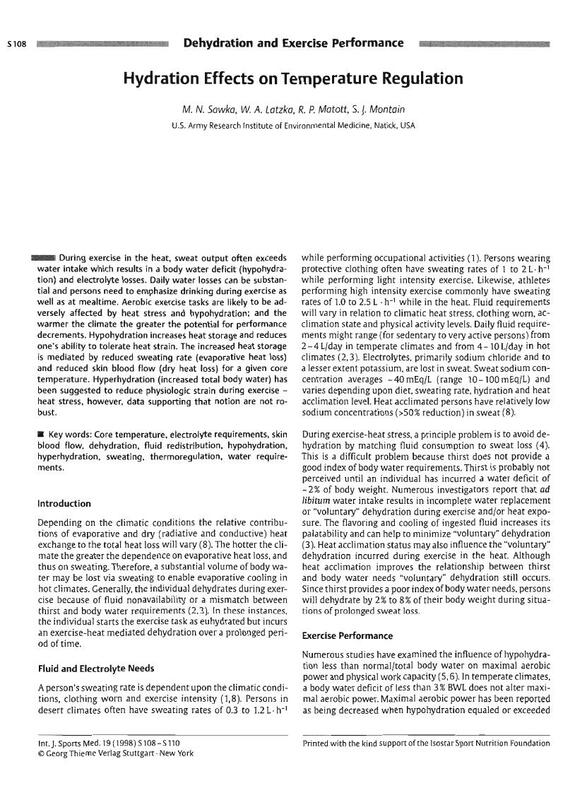 Aerobic exercise tasks are likely to be adversely affected by heat stress and hypohydration; and the warmer the climate the greater the potential for performance decrements. Hypohydration increases heat storage and reduces one's ability to tolerate heat strain. The increased heat storage is mediated by reduced sweating rate (evaporative heat loss) and reduced skin blood flow (dry heat loss) for a given core temperature. Hyperhydration (increased total body water) has been suggested to reduce physiologic strain during exercise -heat stress, however, data supporting that notion are not robust.